So what are these heavenly treats? 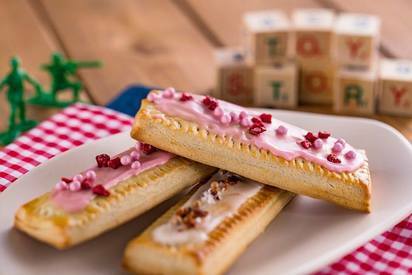 Basically, they’re fancy homemade Pop-Tarts! According to Disney, they’re “inspired by breakfast toaster pastries. This modern interpretation, with its uniquely delicate crust, is the perfect hand-held pastry.” The hardest part will be choosing which flavor you want to try first — raspberry topped with dried fruit or chocolate-hazelnut garnished with caramelized Bacon. Nutella and Bacon? Yes, please!